Replace Silicone Elastomer or other inferior coatings with BCS Baguette Series of coating systems. • We can rapidly recoat your existing screens or replace the old screens with a new aluminum insert, exactly matching your dimensions and perforation patterns. 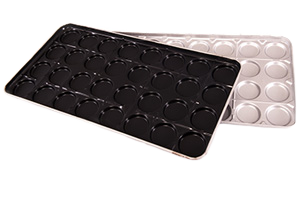 • Sizes supported include all Mecatherm™ sizes including 600x800mm, 800x1200mm, 800x1600mm and 800x2000mm ” Mega” pans. • No more peeling or bare spots from worn silicone coatings. • Up to 10,000 cycles of worry free baking production. • Try our new Hidden Rivet Technology. • Save as much as 200% versus silicone elastomer and 100% versus other underperforming fluoropolymer coatings. • Coatings are resistant to cheese, onion or other toppings, and multigrain, sour, or other more aggressive doughs. • Resistant to blast freezing for par-baked product. • All coatings are in compliance with FDA, CFIA and other food-contact regulatory agencies around the world and made PFOA free.